Application Deadline January 15, 2016. Visit http://pcad.edu/designathon/ for more information and how to apply. 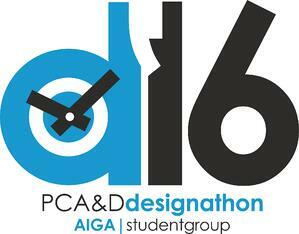 Over a 24 hour period, Pennsylvania College of Art & Design students and faculty members and countless gallons of coffee will be tapped to create professional-quality design materials to benefit local non-profits during PCA&D’s 8th annual Designathon, scheduled from 6 p.m. Friday February 19 to 6 p.m. Saturday February 20. The 24-hour Designathon is an annual event held by the college’s American Institute of Graphic Arts Student Chapter (AIGA) that provides professional-quality design services at no charge to area non-profits and to the community-at-large. Students at PCA&D who participate in the Designathon gain real-world experience in creating projects for clients under a tight, 24-hour deadline. They learn that non-profits have very real marketing needs in order to be successful, and strong graphic design on well-organized collateral pieces are vital components in successful communications and marketing plans. More importantly, students experience the value of giving back to the community. Watch our video! "It was my third time participating, and I never slept or took a nap for the times I have participated. But it was a rewarding feeling to create work for our non-profit. I’ll always remember and think back to these days, it’s the only times I would stay up for more than 24-Hours."